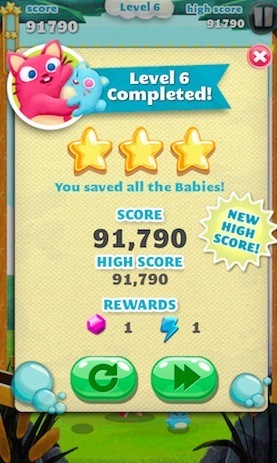 Pop bubbles to rescue the baby animals trapped inside by an evil wizard. Bubble Mania is a classic bubble shooting game, in which you have to match three bubbles of the same colour to burst them. As some people are colourblind, the app takes this into account, and gives you the option to have symbols on the bubbles so that you can tell them apart. Bubble Mania has a similar 'cutesie' style to Bubble Shooter, but differs in a number of other ways. For example, Bubble Mania has more interesting environments. The levels are divided into islands, each of which have a different theme. Your basic environments include jungle, field, pond, and underwater cave, but there are also more playful places, like Ice Cream Island. Although there are more varied environments, there are, however less levels; while Bubble Shooter hosts a puzzle and arcade mode, Bubble Mania only has one mode of play. It is also rather annoying that you have to be connected to the internet to play. On the other hand, having an internet connection does have its advantages, because it allows the app to automatically update the game with additional levels as they get created. You can also compare your high scores with your friends' scores. I would say that the difficulty of Bubble Mania is less of a challenge; you are not under a time constraint because the bubbles do not descend during gameplay. It is also a lot easier to burst a large proportion of bubbles in one shot. What is most important with Bubble Mania is accuracy because you have a limited number of bubbles to use per level. If you run out then the game is over. Before each level, you can buy power ups, which include extra bubbles, doubling your score, rainbow bubbles, and an arrow tool. The arrow is very helpful in directing your bubbles more accurately, as they have a tendency to bounce in directions you don't expect. You can buy boosts with coins and lighting bolt gems that you earn after each level. You can also purchase gems from the online store or by downloading more games made by TeamLava. The game is very addictive, made all the more so by the fact that you don't get taken back to the main menu after finishing a level or completing and island. It just keeps taking you on to the next round. That gives it that 'just one more go' quality to it. As you go through each level, additional types of bubbles appear. These include black bubbles that don't burst, ice bubbles which transform when the surrounding bubbles are burst, and rainbow bubbles that fit any colour. At the end of each level, you get a star rating out of three, which you can monitor during gameplay with a star meter in the top left hand corner. You can fill the meter by scoring points, which can be done in a number of ways, such as freeing baby animals and bursting a large quantity of bubbles at once. The remaining bubbles you have left over in your arsenal also gives you a bonus score. The easy controls and easy learning curve makes this instantly pick-up-and-playable. The only real disadvantage is the need for a wi-fi connection, which means, unless you have 3G, you are relegated to playing at home.